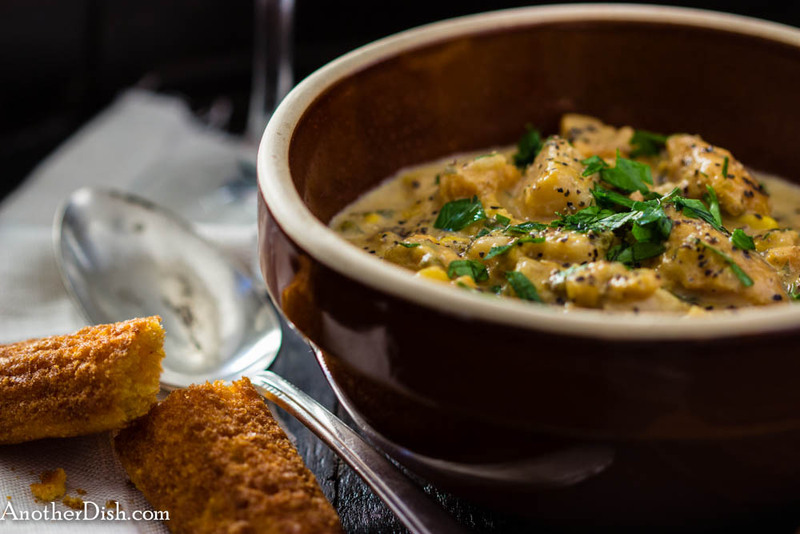 This extremely tasty chowder warms the soul on a chilly autumn night. I enjoy any type of chowder (fish, clam, corn, you name it! ), but I find this version particularly interesting because of its use of sweet potatoes, sherry and thyme, and the crème fraîche adds a delicious finishing touch. Long list of ingredients in this recipe, but it’s really easy to prepare — I hope you’ll try this chowder one night! Heat bacon in a small pan over medium-high heat. Cook until bacon is crisp and fat is rendered, about 5 minutes. Remove bacon with a slotted spoon to paper towels. Reserve 1 tsp of the bacon fat. Heat butter in a large Dutch oven over medium-high heat. Stir in the leeks, shallots, celery and reserved tsp of bacon fat. Sauté about 8 minutes, until leeks and shallots are translucent (and not burnt). Add the bay leaf, garlic, red potatoes, sweet potatoes and corn. Cook 8 minutes, stirring often. Stir in the wine and sherry. Reduce heat and cook 5 minutes. Stir in the parsley, thyme, salt, pepper, cayenne and stock. Bring to a boil. Reduce heat to low, cover partially and simmer for about an hour, until the potatoes are soft, but not falling apart. Remove from heat. Stir in the crème fraîche and season with additional salt, if desired (I added another 1 tsp salt, which seemed about right). Pour into serving bowls, and garnish with chopped parsley and black pepper. I like to serve this dish with cornbread sticks. This entry was posted in Comfort Food, Main Dishes, Vegetables and tagged Comfort Food, Cooking, Corn, Corn Chowder, Food, Food Photography, Foodie, Recipes on November 23, 2014 by AnotherDish. Most vegetable dishes are best when prepared with fresh ingredients. I love corn chowder, however fresh local corn is not available in New England until late summer. Luckily, this delicious recipe calls for frozen corn, so I make it at any time of the year (I use name-brand sweet corn). Yesterday was a beautiful spring day, which got me in the mood again for this chowder. I hope you’ll try it! Place potatoes in a sauce pan and cover with cold water. Bring to a boil and cook until potatoes are tender, but not falling apart. Total time from when you turn the heat on should be about 15 minutes. Strain and set aside. Heat bacon in a Dutch oven. Cook until crisp. Remove bacon from pan (leaving drippings behind) and set aside. Add the scallions and celery to the pan, and saute on low for about 5 minutes. Meanwhile, set 1 cup of the corn aside. Place remainder into a blender, together with the milk, sour cream, oregano, salt and pepper. Blend to a puree, then add to the scallion mixture in the Dutch oven. Add the potatoes. Bring to a boil, then simmer on low for about 10 minutes, stirring constantly. Remove from heat and season with additional salt and ground black pepper. 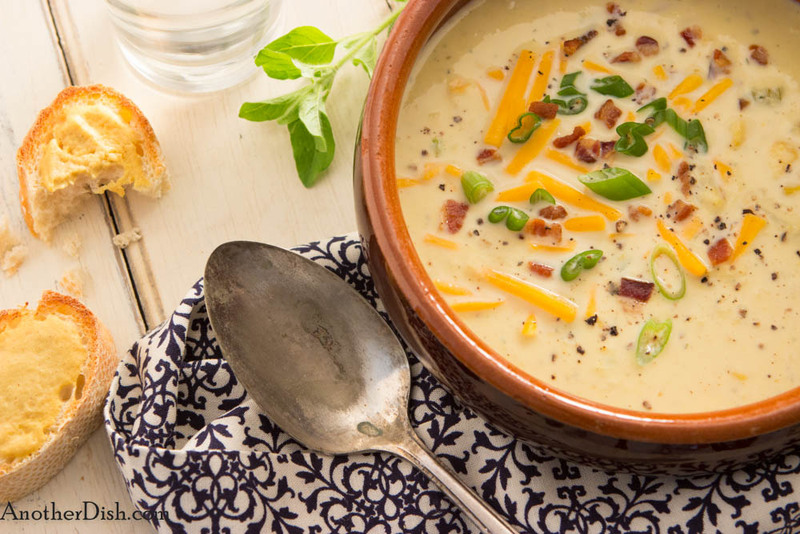 Garnish each serving of the chowder with the some of the bacon, sliced scallions and cheddar cheese. Serve with the croutons. This entry was posted in Comfort Food, Main Dishes, Vegetables and tagged Chowder, Comfort Food, Cooking, Corn, Corn Chowder, Food, Foodie, Oregano, Recipes on May 5, 2013 by AnotherDish.